When Ethan was little, cooking dinner was difficult. These days, it's one of our favorite things to do together. Every evening he runs into the kitchen, pushes the step stool up to the counter and eagerly awaits the cooking process. 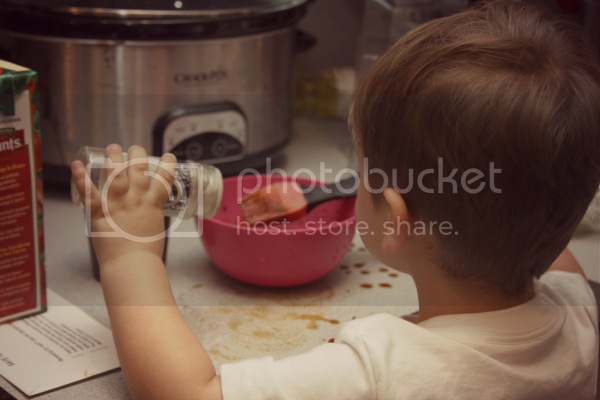 He loves to help in the kitchen, which usually includes whipping up a "sauce" with whatever he sees on the counter. In this instance, it was some soy sauce, tomato sauce, black pepper and cinnamon. "Daddy will just love this," he giggled with every stir of the basting brush. The envelope sitting under the box of tomato sauce is his recipe. Whenever he holds it up, examining the words printed on the envelope, he nods and confirms: "add more salt. The recipe says add more salt." That's so cute that he loves to help you cook! Aww. I think the admin of this website is genuinely working hard in support of his site, since here every information is quality based material. developers are using it to develop games for mobile platforms - predominantly i - OS and Android.